Buy now this product together with Bacon Pancetta Nocker pieces vac. appr. 250 gr. Bacon Pancetta Nocker pieces vac. appr. 250 gr. ready for shipment: in ca. 5 days Bacon Pancetta Nocker pieces vac. appr. 250 gr. Because sesame contains among others unsaturated fatty acids, proteins, dietary minerals, E and B vitamins, it makes our Schüttelbrot very easily digestible. The careful addition of local spices rounds off this unmistakable culinary experience. Sarntaler Hot "Hunters" Sausages L. Moser - approx. 150 gr. The preparation of the Sarntaler "hunters" occurs of pure pork with low fat portion. They mature of course in the Sarntaler mountain air and are not smoked. They distinguish themselves with a special mildness. They are not sensitive to warmth and are suited especially for longer wanderings as a miraculous meal. Easily in the weight, practically to take, nutritious in the salary. Top quality at a reasonable price. South Tyrolean bacon Senfter G.G.A. Core piece approx. 350 gr. 10,00 EUR / 28,57 €/kg. Traditional Speck 1/4 flitch of bacon approx. 1 kg. - Butchery Hell 18,70 EUR / 18,70 €/kg. South Tyrolean Alpine ham approx. 400 gr. - butchery Gruber 16,00 EUR / 40,00 €/kg. Venison raw ham Steiner approx. 300 gr. 26,10 EUR / 87,00 €/kg. Speck Bacon Villgrater 1/4 approx. 1 kg. 17,90 EUR / 17,90 €/kg. Juniper ham Villgrater approx. 500 gr. 9,55 EUR / 19,10 €/kg. House Speck Bacon Steiner core piece approx. 500 gr. 10,95 EUR / 21,90 €/kg. Sarntaler bovine handle L. Moser approx. 300 gr. 14,05 EUR / 46,83 €/kg. Imperator Speck with herbs 1/4 vac. appr. 330 gr. 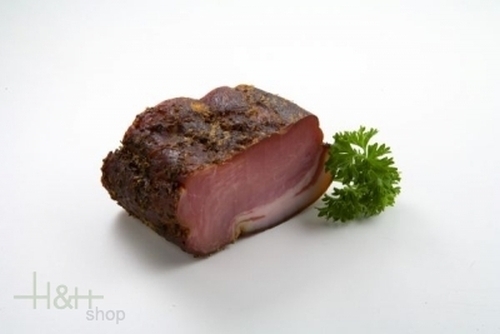 - Kofler Speck South Tyrol 8,85 EUR / 2,68 €/100 gr. Original Speck Bacon Villgrater finely sliced ca. 200 gr. 7,35 EUR / 3,68 €/100 gr. Smoked Bovine Handle Senfter approx. 350 gr. 13,80 EUR / 39,43 €/kg. Top quality at a reasonable price. ..